I've had the idea to do colored pencil or pastel drawings based on old family photos for a long time. One photo that I finally settled on was taken by my father-in-law over sixty years ago. He was a camera enthusiast and worked in a camera repair shop for many years. In his youth he took many interesting and engaging portraits of friends and family. 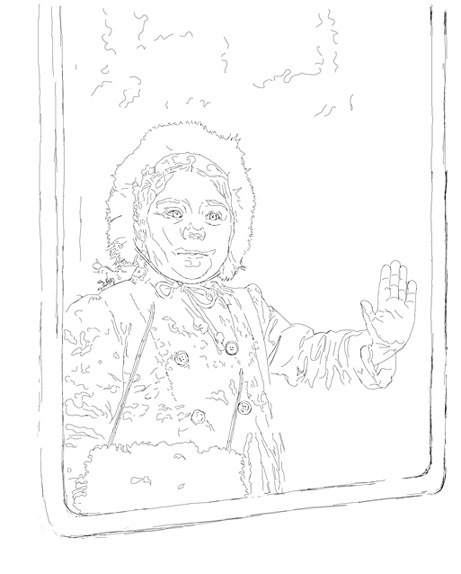 In particular was this portrait of a young niece of his standing in a window. Much of the appeal of the photo lies in the innocent charm of the young subject. 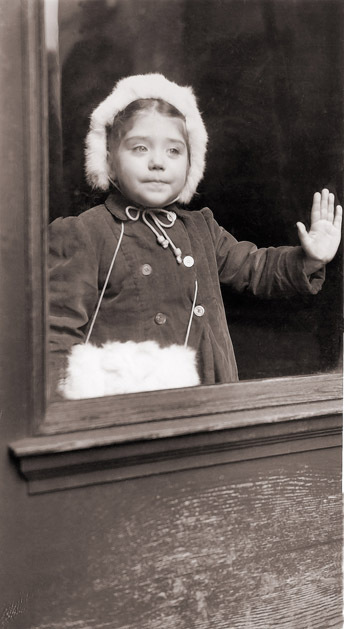 The photo is obviously posed considering that she is dressed for the cold in coat, hat and muffler though she seems to be indoors gazing out. Though the original photo is very small, through the magic of a good scan and Photoshop I was able to get a a good close look. It also allowed me to trace out a detailed line contour directly from the image. I made only a few changes to the composition. In general the original composition is lovely, I just cropped out a little on the bottom for a tighter focus on the girl. I also thought that it would make more sense if the young girl, dressed for traveling, were gazing out of a train window, perhaps saying sad goodbyes to loved ones being left behind. The result was the following line drawing. I tried to capture as many reference lines as possible especially for the transitioning shadows and highlights on her face. It was harder to do than I imagined since the transitions of light and dark here are so subtle. My medium and paper of choice for this piece will be pastels on Fisher400 paper. It all is kind of ambitious for me since pastel is the medium I have the least experience with and I had never used the Fisher400 sanded surface before. My main reason for using the pastels were that I want this piece to have a soft dreamy quality to it and pastels are much better suited to give this effect than colored pencils. Well, at least I thought it would be easier anyway. As for the paper, I've heard all sorts of good stuff about it, especially for pastels. Eager to get to the fun stuff I hurried onto the next step which was to transfer my line drawing to the Fisher400. I sized the sketch in Photoshop to about 27 x 19 inches and printed it out in parts to two long sheets of layout paper. Once I taped the parts together I placed it on my paper with a sheet of red Saral transfer paper in between and started the long tedious process of tracing the lines. I made a good start on the prep work, but it's time to call it a night!